Open 7 Days A Week. Rain or Shine. 10:00am Daily. TRAVEL 200 FEET UNDERGROUND AND 100 YEARS BACK IN TIME! You and your family will enjoy a 40 minute Underground Adventure of the mine with one of our friendly and knowledgeable staff members. As you descend the stairs, you will hear tales of miner?s struggles to uncover gold deep within large Quartz veins. Your tour guide welcomes interaction from the group as you experience life as a miner at the turn of the century. After your tour, you will receive gold panning instructions from some of the best panners in the world, having won numerous awards in the field. Then you will get a chance to try if for yourself and hopefully you?ll strike it rich! While you are at the mine, don?t forget to try our ?Gemstone Grubbin?? for a great family experience. Everyone will love our water powered flume boxes that quickly wash away material revealing beautiful gemstones! We have buckets for beginners and experts alike. There?s no better way to strike it rich! The Mines remain at a comfortable 60 degrees year round. As a reminder, this is a walking tour. 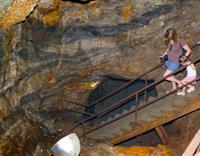 Guests enter the mine via three flights of stairs and two ramps. Tennis shoes are recommended and closed toed shoes are a must! Flip Flops are not permitted for the Underground Adventure.Pets and strollers are not permitted in the mine. We now offer LANTERN TOURS after hours by reservation only. We are now offering Lapidary and Gem Cutting. Stones are cut daily. Turn your rough stone into a Jewel today. Setting are available in gold or silver.